Couldn’t get enough of the “I Am Mormon” campaign? Well, you’re in luck, because Meet the Mormons opened today in 316 theaters across America. This 78 minute documentary film was heart warming, entertaining, and very well done. The cinematography and music were top-notch. But would you expect anything less from The Church of Jesus Christ of Latter-day Saints (LDS)? Blair Treu directed and Jeff Roberts produced, but LDS Apostle Jeffrey Holland was clear that The Church of Jesus Christ of Latter-day Saints produced the film and it was commissioned by the First Presidency. The film begins with the narrator Jenna Kim Jones asking people in New York City what they know of The Church of Jesus Christ of Latter-day Saints or the Mormons. Of course they all displayed a lot of ignorance on the subject. One the questioners said that he heard they were racist. 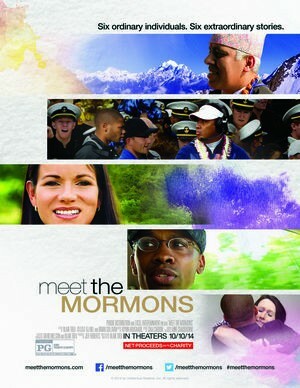 So to dispel that myth, the film introduces you to the lives of six different Mormon families from varied races, focusing on particular individuals within those families. Jones says, “Though these six different stories reveal a few of our basic beliefs, I think you’ll learn of who we are because of those beliefs” (emphasis added). So don’t look here for a clear statement of doctrinal beliefs that make Mormons unique from all other Christian churches. If that’s what you’re looking for, then please watch this 4-minute cartoon called Mormon Secrets: What the Missionaries Don't Tell released earlier this week, which accurately portrays what LDS really believe (minus the extra marking on the left knee of the temple garments). You may also be interested in viewing this hidden video of what Mormons actually do in their temple ceremonies. The first individual featured is Jermaine Sullivan, who it’s no coincidence is a black bishop in Atlanta, GA. Darius Gray, who has done a lot of black race relations work for the LDS Church, evidently goes to this ward in which Sullivan is the bishop, and Gray said, “Bishops in our faith, Sunday school teachers, any of the administrators, none are salaried. None receive any financial compensation. So it is not a paid ministry; it’s not a paid clergy.” Sullivan then says of his wife that “she serves, she teaches the youth in the Church. She doesn’t get any money; no one does.” This is somewhat misleading, since it only has to do with the local church level. General Authorities who serve over the entire Church as well as Mission Presidents do in fact receive a modest living allowance (Daniel H. Ludlow, ed., Encyclopedia of Mormonism, Vol. 2. [Macmillan, 1992], 508 and 510; also cf. the following LDS source). It was also interesting to me that Sullivan’s sister is a Baptist, and she said, “We never really had a religious disagreement. Even though the faiths are different, the belief is the same.” Sullivan went on to say, “I’ve always tried to build on common beliefs. I can always acknowledge that they’re going to be differences. There’s no need to debate so much about that.” “It’s who you are as a person,” the sister asserted. One gets the impression that the Baptist sister thinks of Mormons as just another denomination within the Body of Christ. It’s like she has no idea that LDS are quite different from most other denominations in claiming to be the “one true Church” (Doctrine and Covenants [D&C] 1:30), and as such, she assumes that doctrine really doesn’t matter. However, the Apostle Paul told Timothy not only to watch his life closely, but also to watch his doctrine closely and by persevering in them, he would save both himself and his hearers (1 Timothy 4:16). When one does this, and then becomes aware of how radically different LDS teaching is on the nature of God and Christ, then religious disagreements should naturally arise. This isn’t to say brother and sister should be disagreeable and unloving toward each other, but it is to say that there should at least be concern that the other has indeed a different belief. Jesus Himself warned of false Christs and false prophets that would come in the last days (Mat. 24:24). The Baptist Christ and the LDS Christ are definitely not the same (cf. the home page chart of differences on www.MormonInfo.org). Granted they both may turn out to be false, but they certainly cannot both be true since they contradict each other. Sullivan said he views Christ as a person, who is “all powerful.” However, it is difficult to understand how LDS view Christ as truly all-powerful since they don’t hold that He’s the creator of literally everything outside Himself as traditional Christians hold. The LDS Christ was born of heavenly parents in a pre-earth life and had to progress to His Godhood. Thus, there was a lot in existence that He isn’t responsible for and He needed prior to becoming a God “for us.” Christ did not create the planet He was born on as a spirit-child prior to coming to this earth, He didn’t create or does not rule over His spirit-grandfather’s planet, and since matter is eternal according to D&C 93:33, He didn’t create it either. So “all powerful” in LDS categories at best becomes relative to being in charge of this world, but obviously not all worlds whatsoever. The second individual featured was the US Naval Academy football coach Ken Niumatalolo. Niumatalolo is a Pacific Islander, and he too has a black bishop. Now if that’s not shattering Mormon stereotypes, President Obama makes a cameo in this section of the film giving USNA an award. Evidently this cameo must have been important, at least in part, since the president is partly black and a democrat. The third individual featured was a Costa Rican kickboxer Carolina Muñoz Marin. She converted from Catholicism after meeting some LDS missionaries. Her Catholic father acknowledged that she was changing from one religion to another. Her Catholic mother said, “We support her in her faith. As long as she is devout in that, she will undoubtedly have our support.” One has to wonder how serious her parents are about their own faith. Do they actually hold that their religion is true and other religions are false? If that’s the case, then why would they support their daughter in choosing a false religion? In an attempt to shatter stereotypes of women in the LDS Church, Carolina’s brother-in-law, Freddy Marin, said, “Many people think that women should be subject to man, but in reality, in the Church, it’s not that way.” That’s a little hard to accept for at least several reasons. First, the Mormon God is an exalted man that both men and women are subject to. Second, women don’t have the priesthood in the LDS Church. Third, a widower may get sealed in marriage for time and all eternity to another worthy woman, but the woman can’t defy the male priesthood and get sealed to another worthy man even if her husband dies. She may only remarry for time. Fourth and finally, a temple worthy couple gets new sacred names in the LDS temple ceremony. That new name is so sacred that LDS are instructed not to reveal it to anyone. The only exception is that the wife is to reveal her sacred name to her husband, so that he may use it to call her up on the morning of the resurrection and go onto their exaltation or godhood. The husband doesn’t reveal his new name to his wife. And you wonder why LDS women are so burdened in their quest for perfection that they feel the need to take anti-depressants? Utah, which is around 60% LDS, is #1 among all the states in prescription anti-depressants (e.g., see here, here, here, and here). The fourth individual featured is 92-year-old Gail Halvorsen. He is famous for being the “Candy Bomber” during the 1948 Berlin Airlift. He won the hearts of the West Germans by dropping candy for their kids from his plane, and thereby kept Soviet controlled East Germany from taking over the entirety of Berlin. The fifth individual featured is a Nepal humanitarian Bishnu Adhikari. His wife said, “We worship Jesus Christ as the Son of God.” There are a couple things interesting about this statement. First, LDS worship a plurality of Gods (Father, Son, and Holy Ghost in one Godhead) despite the fact that Jesus taught you should worship the Lord God and Him only serve (Mat. 4:10), and one can only serve one master (Lk. 16:13). Second, what sort of worship is it when LDS don’t even pray directly to Jesus? They may only pray directly to Heavenly Father in the name of Jesus. So worship for an LDS person looks quite a bit different from a traditional Christian. Adhikari stated in Mormonism, there’s “no fear. It’s rather a love.” He went on to say that “continuously trying for improvement is the foundation for the gospel. I’m perfect in trying.” However, his own late Prophet Spencer W. Kimball said, “Trying Is Not Sufficient[.] Nor is repentance complete when one merely tries to abandon sin. …To ‘do the best I can’ is not strong. We must always do better than we can” (The Miracle of Forgiveness, 164-5). D&C 58:43 says, “By this ye may know if a man repenteth of his sins—behold, he will confess them and forsake them.” Since none of us can do this, how is this good news (the actual meaning of “the gospel”)? Where is the peace with God here (cf. Rom. 5:1)? Where is the assurance that one’s sins will ever be forgiven? Both the Bible as well as the Book of Mormon are quite clear that we only have this life to make our repentance complete (Lk. 16:19-31, Heb. 9:27, and Alma 34:32-5). This is why no Mormon knows whether he will make it to the Celestial Kingdom eventually. Because the focus is on one’s pathetic self! The sixth and final individual featured in this film is a mother of an LDS missionary. Her name is Dawn Armstrong, and her son ends up being sent to South Africa to serve. Before the son leaves, he tells his Missionary Prep class, “Make sure you are worthy to go.” Well if that was the case, none of us should be going on missions. The mother says, “You can always be at peace with things.” But as we just saw, LDS can never be at peace that they will be with their Heavenly Father someday. Further, their temple sealings to their families are only conditional on how well they perform. So no, LDS can’t always be at peace with things. In conclusion, let’s revisit that crazy statement that one guy made at the beginning of the film: he heard Mormons are racist. How can there be any truth to that statement after watching a film about such a diversified religion? One reason may be because the God of the Book of Mormon is a white supremacist, who curses people with dark skin so they won’t be enticing to His righteous white skin people (2 Nephi 5:21-3 and Alma 3:6-9), and as these dark skin people repent, their curse is taken from them “and their skin became white” (3 Ne. 2:14-6). Another reason for the accusation of racism may be from the other book of LDS scripture, The Pearl of Great Price. In Moses 7:8, 21 and 22, it seems to indicate that the mark Cain received was a blackness which was passed onto his descendants, and that it barred him and his seed from Zion, the future abode of God. Another reason may be from a First Presidency statement in August 17, 1949, which was further taught by other prophets and apostles. This is a teaching that blacks received their skin color because they did not fight as valiantly for the Lord prior to coming to earth (cf. Bruce R. McConkie, Mormon Doctrine, 24th printing , 527-8; and Prophet Joseph Fielding Smith, Doctrines of Salvation, vol. 1, 66-7). A final reason may be if “God is the author of diversity” as Darius Gray reminded us in the film, then why don’t we see that diversity reflected at the top of His supposed “one true Church”? It looks overwhelmingly like an old white man’s club (see here). The First Presidency and all the apostles in the LDS Church are all white. This seems quite out of step with what ABC News reported several days ago: “In 1997, the number of members outside the U.S. surpassed the number inside the country, and since 2000, there have been more non-English-speaking Mormons than those who speak English.” For more on LDS demographics, see here.